How can I use cjk path in \include command on windows? I want to use \input or \include command to include a file that name with cjk characters. LaTeX Error: File `涓枃.tex' not found. (Font)              <8> on input line 4. (Font)              <6> on input line 4.
! LaTeX Error: File `中文.tex' not found.
! LaTeX Error: File `����.tex' not found. with all the characters being replaced by U+fffd "replacement character" rather than showing wrong characters as in your example, but the details of the utf-8 decoding may depend on the version of xetex that you have. Not the answer you're looking for? Browse other questions tagged windows include cjk or ask your own question. 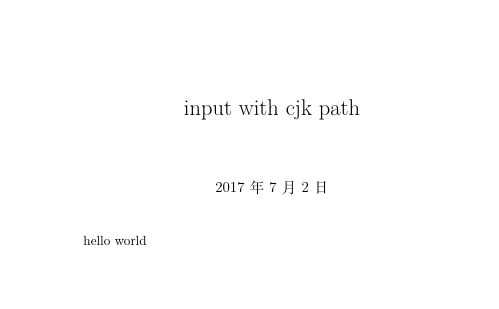 How to use CJK environment in footnote?